The totally reliable advanced pumping mechanism is specially designed to avoid maintenance, i.e., it is maintenance free, and more importantly it has been developed to eliminate leaking and or other common faults of traditional dispensing systems. It is suitable for use with both liquid soaps and hand lotions. The Serra Cel incorporates a front vertical level inspection window for quick visual soap level check. The Serra Cel dispenser is easily and quickly refilled, on the wall, when the soap level is low. The 800ml capacity reservoir provides in excess of 600 individual 'shot' washes, which makes the Serra Cel an extremely economical and particularly suitable multi-use soap dispenser. The Serra Cel incorporates an advanced pumping system designed to meet stringent conditions. 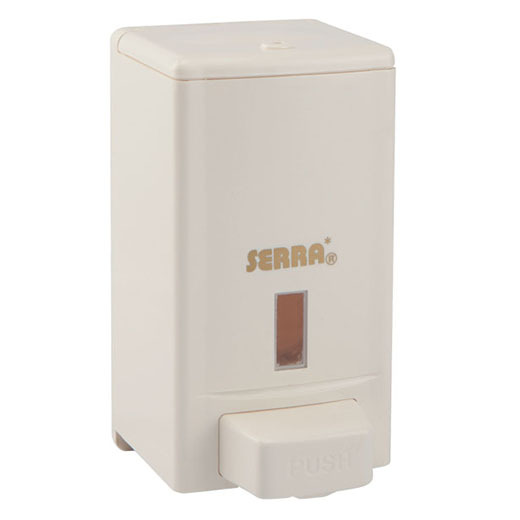 The dispensing method/system of the Serra Cel Soap Dispenser is hand (palm) operated by a gentle inwards press of the 'push' button. The liquid soap is dispensed through a conveniently positioned spout which is built into the bottom of the push button, i.e., the button and the dispensing spout operate as one unit. The method of operation is simple and quick. It is more reliable and robust than the traditional trigger pull systems, as it's design eliminates strain on wall fixings, and consequent damage related thereto.